DJMaza.in is one of those online websites which supports Free Bollywood Songs download in MP3 format. You can listen to any song online or search for a specific song and download them easily. DJMaza provides music downloads for Mobiles, PC Videos, Lyrics or other songs. It also has a Music section where you can browse songs based on Mobile Videos, Remix Ringtones, Indian Pop albums or English Pop Songs. iMusic is such a hot production from Aimersoft family for making it super-simple finding your favorite tracks and getting them on your Computer or Apple devices. The software is available for both windows and mac to fulfill the needs of any users. It is a Music Downloader, Music Finder, Music Manager and can even transfer music files between the devices. All features put together outputting an excellent result on this simple and efficient software. iMusic has everything that everyone needs for free MP3 music download. It is the most popular free MP3 music downloader, recorder, music transfer and song manager that lets you to enjoy music anytime you want. 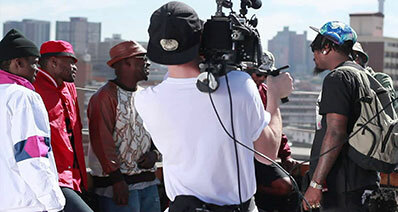 The program has a user-friendly interface and has the capability to recognize the music video you are watching and you can record the music easily. It is one of the amazing features of this application program. It also has a smart “Download” button that assists you if it detects that you are playing a video on your browser like Google Chrome, Mozilla Firefox, or Safari. The program also supports batch processing, which allows you to download an entire playlist or channel in YouTube with its Download All button. Discover: Composed of built-in music library that allows you to enjoy and download the hottest songs and playlists. 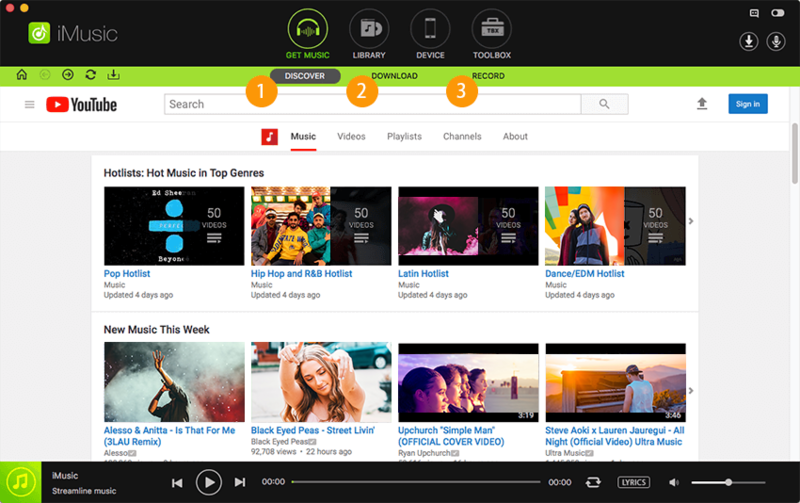 Download: Downloads free MP3 music from more than 3,000 music sites. Record: Record any music you're playing with web browser, music players and other software. Transfer: Transfer music from iTunes library to iPhone/iPad/iPod/Android phones, and vice versa. Option 1: Initially, launch the program and click "GET MUSIC". Now you can see the discover option and click it. A built-in music library will be displayed, where you can view top lists and hottest songs, or you can search your preferred music types. 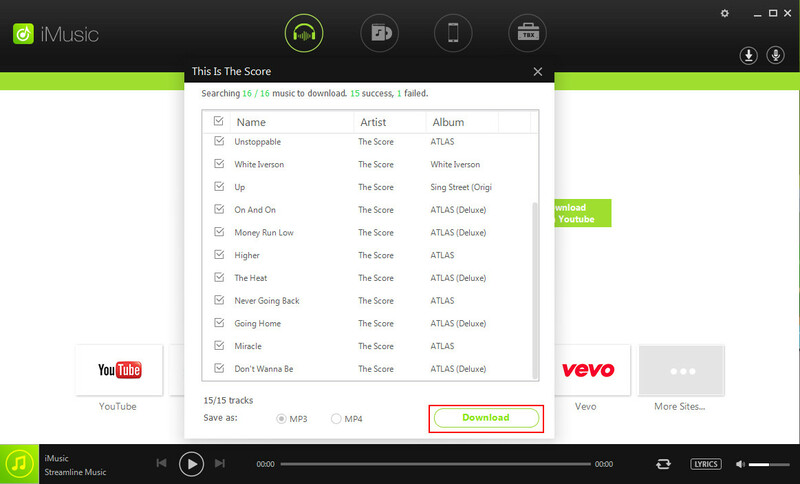 After finding your preferred music, just click it and choose download icon beside the song. This lets the software to download the file for you. Option 2: Select “GET MUSIC” option from the product screen menu bar. In order to begin the first phase of downloading from YouTube just click “DOWNLOAD” button in the same window. You can also click YouTube to redirect to the browser and search for your music or video. Now, copy the link of the song/video and paste in the box provided within the window. Select either MP3 or MP4 as the option and press the download button provided next to the box. The program will begin the download and save it to the library. You can access the file from within the application by clicking the Library button from the menu bar. 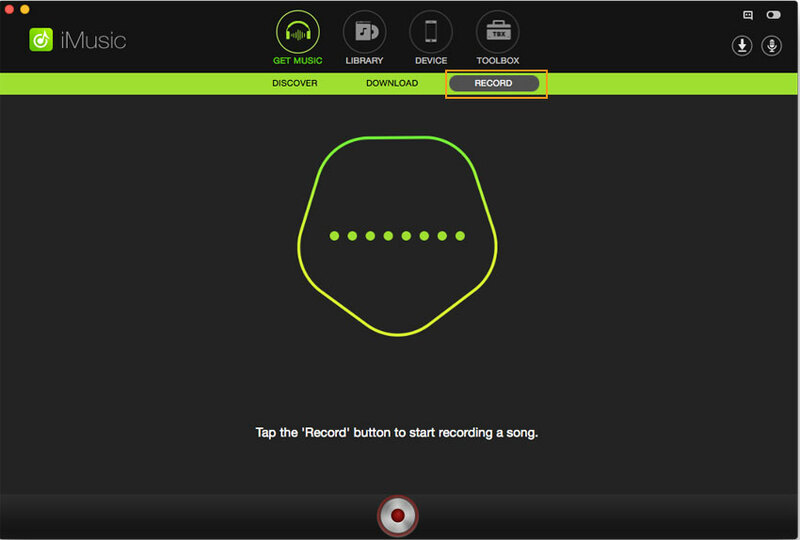 Option 3: iMusic lets you to record any song you're currently playing on your computer as MP3 format. Click "GET MUSIC" > "RECORD". Next, play the song you want to record. After that, you can see that the software begins to record the song for you. DJMazaMP3 is an amazing website, which allows you to download any Bollywood song in MP3 format. It is known for its speedy downloads with good audio quality. You can download songs from from Indian, Karaoke, Hip Hop, Instrumental, Jazz, Blues, Pop and many more. You can easily listen to a particular song and download it in your PC or Mobile device within minutes. Step 1: Go to its website DJMaza. 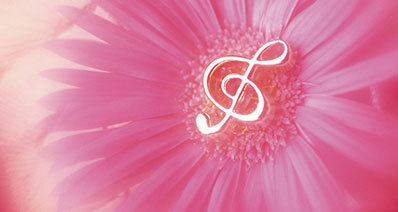 In this website, you can download any song in MP3 format easily. Step 2: Select a Title Track or Song to download. It will open a new window, where you can see a list of all the songs related to that movie (raabta). You can Play the Music, Add to Playlist, Download or use the song as Ringtone as per your requirement. 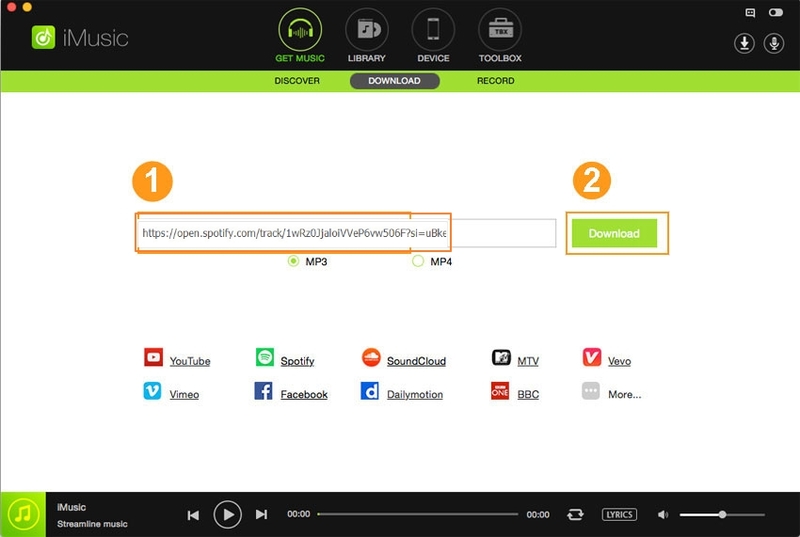 Now, Click Download from any particular song. It will receive prompt a message as System Notification where it will ask for your permission to install an extension to download songs from DJMaza. Click OK. Step 3: Finally, click the Download button. The selected song will be downloaded as MP3 Format in your PC.